Butser Rubber are custom manufacturers and suppliers of many different types of rubber anti-vibration mounts and specialist rubber dampers for all industries. We have an extensive range of over 300 rubbers and silicones including High Temperature and Fuel and Oil resistant materials. 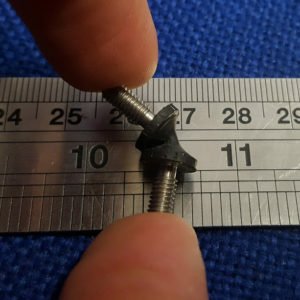 We have a comprehensive range of in-house manufacturing facilities, allowing us to provide fast and effective manufacturing of almost any anti-vibration mount configuration. Anti-vibration mounts can be manufactured using our dedicated Compression, Injection or Transfer Moulding machinery. Butser Rubber offer an extensive range of Rubbers and Silicones to meet aerospace, defence, automotive and commercial specifications. Through extensive investment in the latest rubber moulding machinery, we have been able to increase our anti-vibration mount production capability ten-fold. We can work with prototype designs all the way through to mass production while offering manufacturing guidance throughout. Our anti-vibration mounts can be manufactured to meet industry standards. We can also offer PPAP Level 3 documentation to support the product. Please get in contact with our team for more information. Butser Rubber has formed a specialism in rubber to metal bonded anti-vibration mounts over our 40 year history. We provide a range of bonded mounts including cylindrical mounts, isolator mounts, engine mounts, machinery mounts and shock mounts for an extensive range of demanding industries including motorsport, aerospace and manufacturing. Please get in touch with our team regarding your project requirements. Cylindrical Rubber AV Mounts provide good overall performance to isolate vibrations over a range of frequencies. 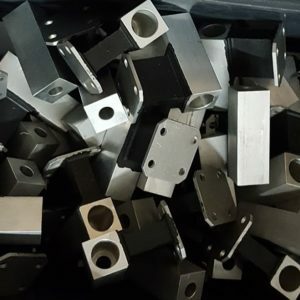 Our investment driven facilities allow us to automate production of rubber anti-vibration mounts for large scale production as well as manufacturing prototype mounts. We also specialise in rubber to metal bonding which means our antivibration mounts have excellent tensile properties. 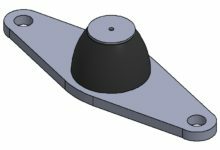 We supply custom rubber cylindrical anti-vibration mounts for many industries including Automotive, Industrial and Aerospace. Waisted Bobbin Mounts are useful for applications that require low shear stiffness properties. The male screws/bolts are available in different thread configurations. Rubber bond materials are available in a range of colours and shore hardness. Butser Rubber also supply specialist materials such has high temperature and chemical resistant rubbers. Typical applications include control panels, electric motors, lightweight equipment. We can supply waisted bobbin mounts in different quantities from one-off prototyping to mass production. Butser Rubber supply vibration damper and shock mounts to a wide range of industries including Automotive, Marine and Aerospace. Our vibration dampers provide excellent isolation of resonating vibration frequencies. Rubber vibration dampers and shocks are suitable protection measures for machinery and equipment. We are able to manufacture vibration dampers and shocks in many different specifications with scope for variation of compression, size, shape etc. 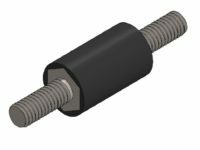 Semi-Bonded Bush Anti-Vibration Mounts provide significant reduction of resonating vibration frequencies through elastic deflection of the bespoke rubber material within the tubular metal surrounding. Our rubber materials can be resistant to high temperatures, oil, fuel and other desirable properties. Typical applications for semi-bonded bush mounts are automotive engines, suspension, generators, alternators, industrial machinery and aircraft machinery. Our experienced team can work with you throughout the manufacturing process to build cost-savings and efficiency into your anti-vibration mount and rubber damper solutions. We work with clients to make completely bespoke rubber components suitable for the project at hand. For more information, contact our team. Or send your project requirements to our team for a quotation.